If, following screening, you think that a child is experiencing reading difficulties, the first step is for them to have a full eye test from an optometrist or orthopist (see “Professionals Involved” section for their roles). This is necessary to help rule out whether the reading difficulties are being caused by an underlying problem with the eye itself. It is possible to have perfect vision but still experience visual stress. – ocular motor function (how well the eye muscles work together, e.g. the test will show if the child has difficulty in moving their eyes together, or keeping the direction of their gaze appropriately co-ordinated). The assessments listed above are not enough to be able to diagnose visual stress, and further assessments need to be performed. The assessment for the coloured lenses will be different between individual organisations and companies. Overlay Assessment – An overlay is an A4 sheet of coloured acetate plastic; they come in many different colours. During the assessment, an overlay is placed over a page of text to see if a particular colour makes reading easier for the child. These individual overlays can be laid on top of each other to produce more colours, e.g. a red and yellow overlay will produce an orange overlay. If one of the overlays makes it easier for the child to read, it may then be recommended that the child uses it for a set period of time (usually about a term at school). The child will then have a follow up appointment and where they (or their care giver) will say any improvements they have had in reading. If benefit is gained from the overlays then an assessment for lenses is recommended. NB Optometrists are not the only ones who screen using colored overlays. Educators, psychologists, and neuropsychologists are sometimes trained to screen using overlays. 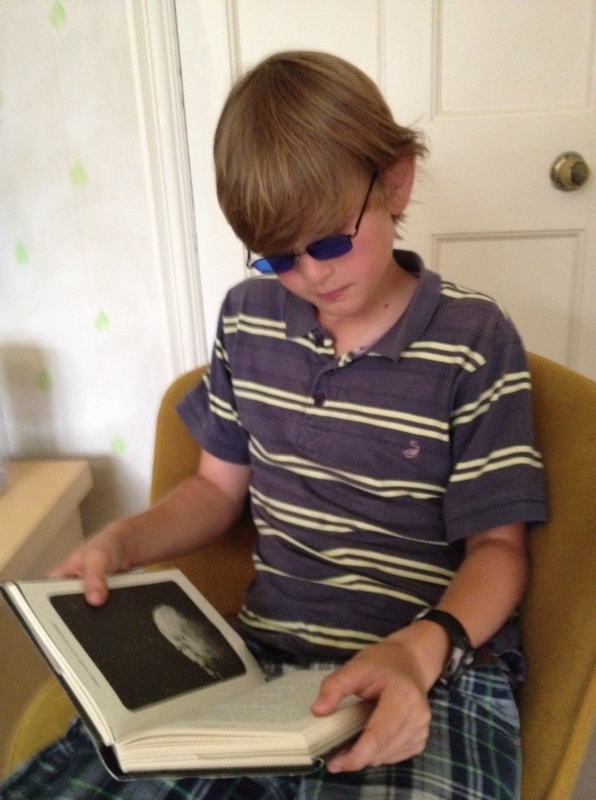 Assessment for Coloured Lens Glasses – Each organisation has a different system, for example the Dyslexia Research Trust finds just blue or yellow are sufficient to improve reading ability. Other providers will try a wide range of colours, based on research that concludes that a large range of colours should be tested to find the optimal tint for the lenses (Irlen 1991,Wilkins et al, 1994). This approach has also been shown to be effective at improving the symptoms of visual stress resulting in improved reading capacity (see ‘Do Coloured Lenses Work‘). 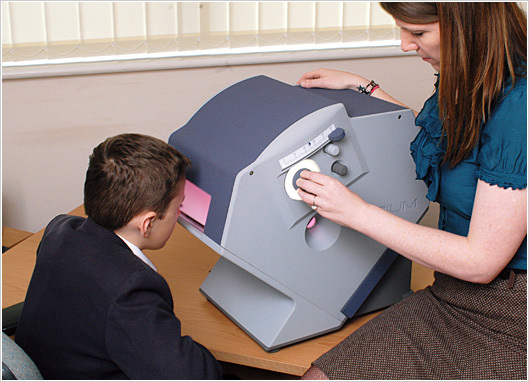 Some assessments take 15 minutes and others about 1 hour, and some involve the child looking into a machine for example the Intuitive Colorimeter , where they will be shown text through different colour filters/lenses to see which colour reduces the visual disturbances when reading. Please note that not all practices have a Colorimeter, and a cost may incur for this assessment. Computerised testing: Another way to be assessed is to be tested on a computer, for example a tool called the Visual Stress Screener (ViSS). This assessment uses a word search game, and the person is tested using a visually ‘stressful’ and ‘unstressful’ screen background. These ‘stressful’ and ‘unstressful’ background results are compared to see the effect on performance. The results will indicate whether the person is experiencing visual stress or not. This assessment is suitable for ages 7yrs and above, and takes about 20 minutes to administer. Wilkins,A. J.,Evans,B. J. W.,Brown,J.,Busby, A., Wingfield,A. E.,Jeanes,R. and Bald,J. (1994) Doublemasked placebo-controlled trial of precision spectral filters in children who use coloured overlays. Ophthal. Physiol. Opt. 14, 365–370.